I truly envy the tai-tai lifestyle in all of it’s wonder and am desperately searching for the apparently absent term describing a male tai-tai which I strongly desire to be (The closest I can come up with is bum). Anyway for bums and tai-tais alike, I believe that this idyllic artsy fartsy cafe aka Food For Thought is a godsend. It is the kind of cafe where the staff are friendly and you can just sit back and relax, enjoy a nice sandwich while watching the world go by. What’s more, Food For Thought is what I would call a “Socially Aware Cafe” as it supports causes such as the education of East Timorese children through the selling of various novelty items and trinkets within the restaurant. 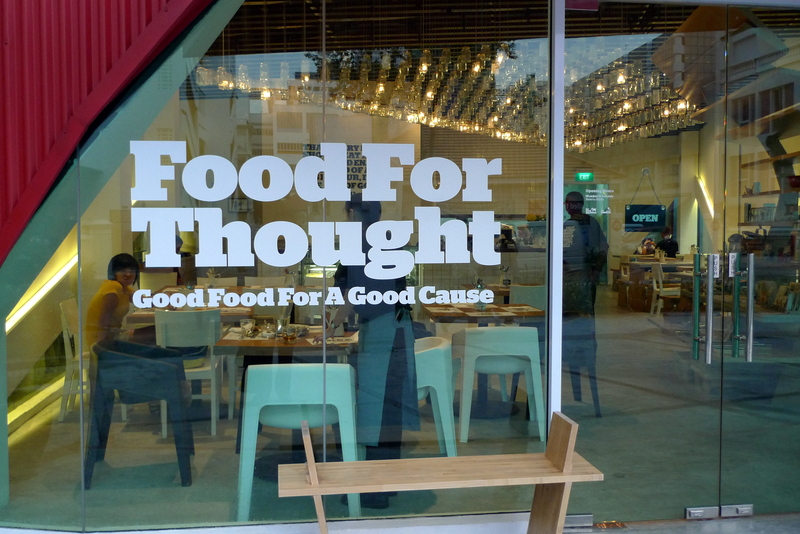 A relatively new establishment, Food For Thought @ Queen Street(located next to SMU’s administration building) is just over a month old(I think) and serves a different menu(I would say slightly more upclass) from the Food For Thought @ North Bridge Centre. 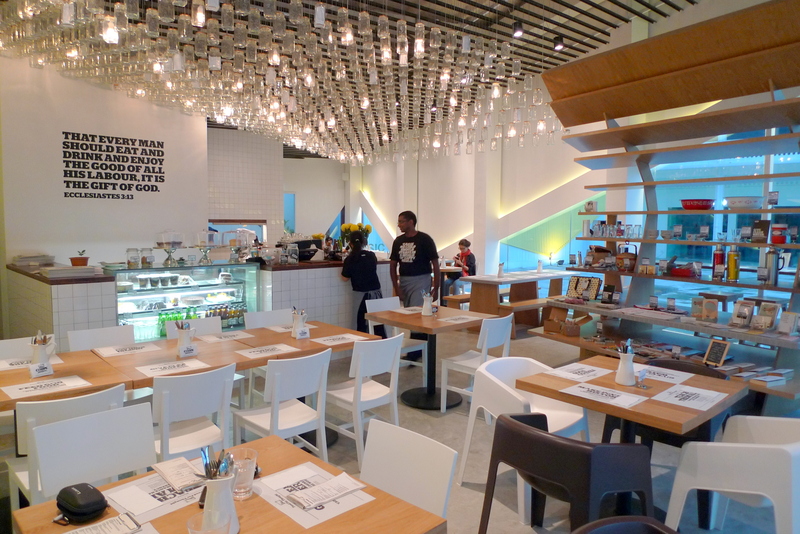 It’s interior design falls under the contemporary and modern category with the glasses on the ceiling very reminiscent of the design @ Mad For Garlic in Suntec City. 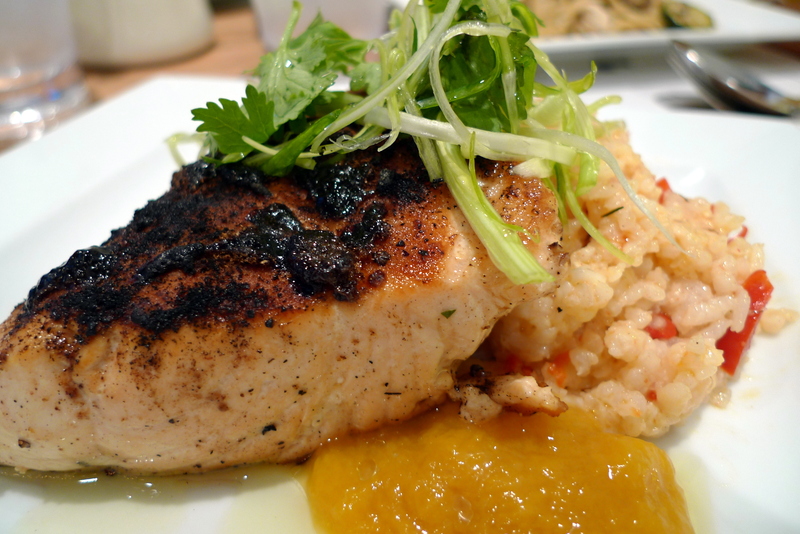 The Chai Spiced Brulee Salmon($22++) was served with Smoked Red Capsicum Risotto & Mango Ginger Chutney. The Salmon was really well executed, a crisp surface unvealing a pink flesh so soft and tender with no hint of overcooking. The Chai Spice gave the Salmon a not so mild sweetness which I felt could have been done without. I didn’t fancy the risotto, a tad too salty for me. Since I’m no mango nor ginger fan, I didn’t really appreciate the Mango Ginger Chutney as it tasted like jam to me but JH and AD really liked it…at least it made the taste of the risotto less overbearing. The Really Good Steak with Blue Cheese Butter($25++) was served with Rosemary Garlic Fries and Honey Shallot Raisin Chutney. 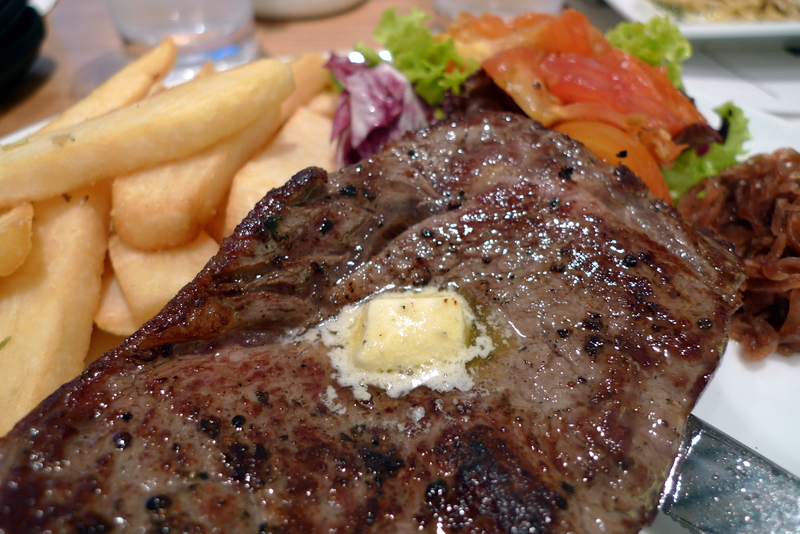 I think Food For Thought made a mistake in my order though, what they served me was just Average Steak with Blue Cheese Butter. Ok, I’m pretty ignorant when it comes to deciphering the different cuts of beef(striploin, sirloin, tenderloin…you get the picture) but I think mine was a sirloin. I’m quite a fussy steak eater and I love the occasional well marbled steak. The one here was too salty and the cut of meat was what I would expect from Astons. Then again, I shan’t continue ranting since you can’t get an awesome cut of beef for $25 anywhere else anyway. The fries were alrite but had I not taken a second look at the menu, I would have mistaken the Honey Shallot Raisin Chutney for plain old caramelized onions. 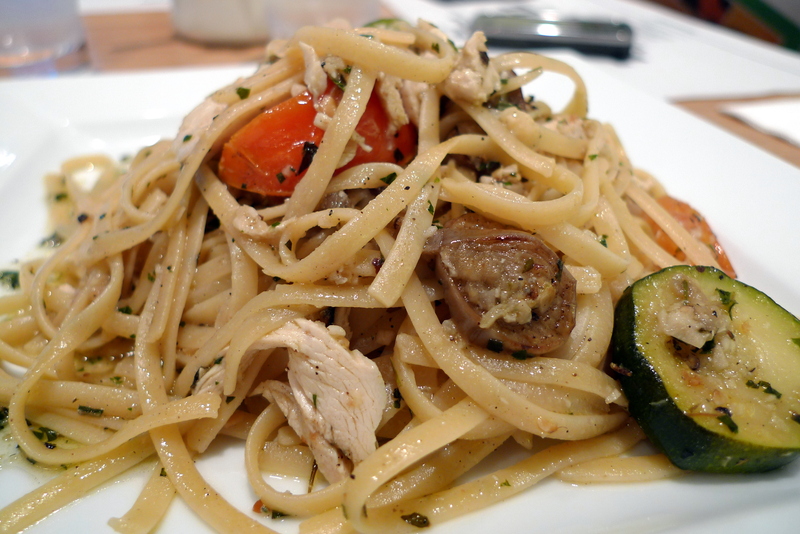 The most delectable main we had today was definitely the Basil Almond Pesto Chicken Linguine($13++). The pasta was a serious al dente which could rival any decent Italian eatery. The plethora of colours originated from the zucchini, tomatoes(which were amazingly sweet) and chicken chunks(very tender and moist despite being breast meat) and the flavours from each ingredient, though subtle, mesh together to create an exceptional dish. I really can’t stop harping about the pasta, it was really that good and didn’t leave me with any unctuousness! The mains here were really quite filling but we had strength in numbers and hence decided to share the Carrot Cake($6++)! 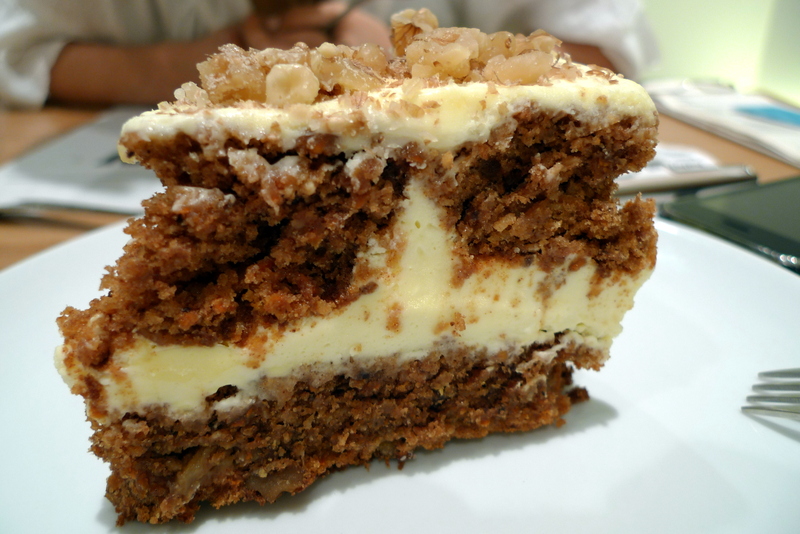 I’d prefer a warmed Carrot Cake instead of the chilled ones sold here but I’d have to say this Carrot Cake has it’s merits. The cream cheese was really thick, slightly sour which suit me just nice but the cake itself was a bit too hard, unlike the softer and lighter cake batters that I love. Overall, still enjoyable. I used to think that you can’t have it all but Food For Thought has proven me wrong. It has shown me that it’s possible to have great food, pleasant ambience, friendly service and still leaving room for a heart for the needy. Hmm I guess my dining options around Queen Street requires no more food for thought. Categories : All YumYums in my TumTum, City Hall, Fusion, Location of YumYum, Western, Yummy! yoyo peter! awesome food blog you have here. read already really wanna go visit those places. i think i will visit here quite often, support support a bit haha. keep the updates and reviews coming! I didn’t know there’s a cafe ard SMU area. Will definitely go check it out! chinnam hello! wa long time no see. yup i shall steadily update la, last time i only review on hungrygowhere.com under username drpiggy but the pictures size limit they allow there is too small liao. pic quality won’t be very gd so decided to set up a food blog. sparkling or still, the cafe is next to smu admin building(behind) and opposite singapore arts museum. are u like an smu student coz i would be seeing u in sch soon if u are. haha, i have left uni for more than half a decade! oh i do rmb a drpiggy on hgw haha, i rmb as someone who writes very detailed reviews.